A few summers ago, Hacky Zak got a job running the Bumper Beans at Powder Point. Being a fun loving, laid back kind of guy, he quickly made friends with all of the workers at the park. 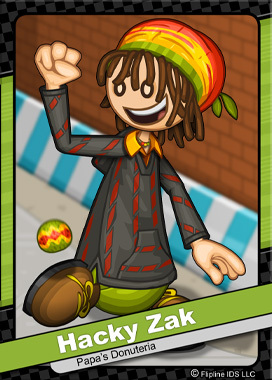 Nowadays, Zak can always be seen goofing around the park while munching on the free snacks he gets from his concession stand buddies. His current job at the park remains a mystery, because for the last year or so, nobody has actually seen Zak "working".